Have you ever felt like you had a profitable work month only to look at your bank account and wonder where all the money went?I have a friend who owns a business that takes in $12,000 a month, and after she checked her monthly expenses, she said she had only spent $4,000, but still couldn’t figure out where the other $8,000 went. I know I’ve miscalculated my gains and expenses before, more than once. Many business owners tend to think that Sales – Expenses = Profits, but that’s not the case. It’s common for most of us to have one checking account where all of our money comes in and out of. But when our income is so closely linked to our expenses it can get confusing to track where your money went at the end of the month. Last month I read a book that revolutionized the way I organized my business accounts, and I’m so happy with this model that I’d like to share it with you. The book is called Profit First: Transform Your Business From a Cash-Eating Monster to a Money-Making Machine by Mike Michalowicz. In his book, Michalowicz introduces an amazing way to keep track of your business finances called the Envelope System. 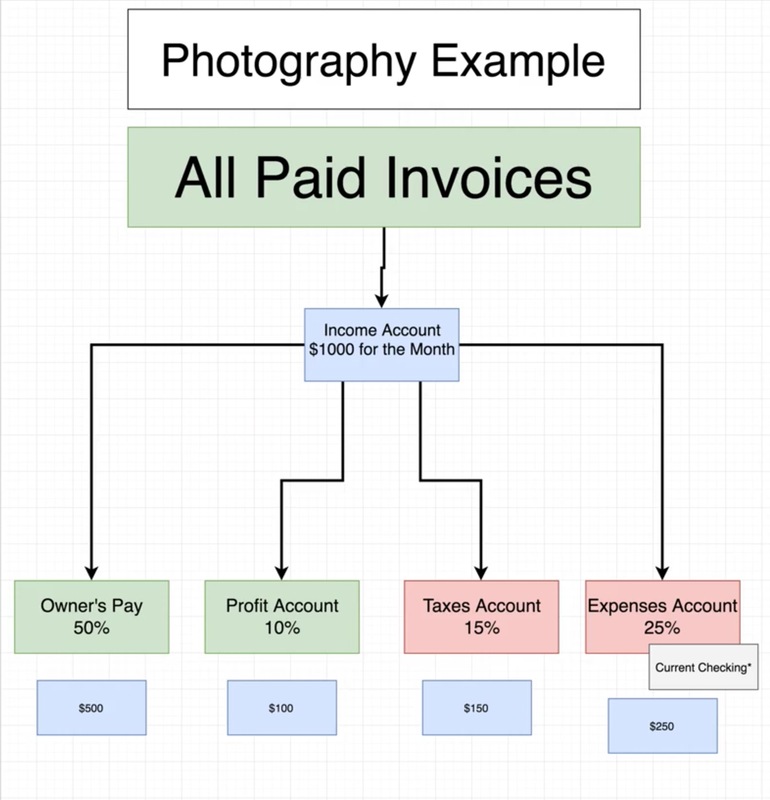 Basically, you would structure your business accounts so that all of your income and paid invoices land in an Income Account. From there, you would transfer the money to 4 (or more) other accounts at different appropriated percentages. As you can see from the diagram above, it’s suggested that you put aside 25% of your earnings in your Expense Account, 15% into an account dedicated to covering tax payment, while 10% should go to your Profit Account, and 50% should be put towards paying yourself. You may not be able to distribute the percentages in the same exact way as the example when you first start out, but you should make it a goal to move towards those numbers if you want to keep your photography business financially healthy. To transition your current account to the envelope system, you can start by converting your current checking account into an Expense Account. Any business expenses, including payroll for any employees, should be made from this account. 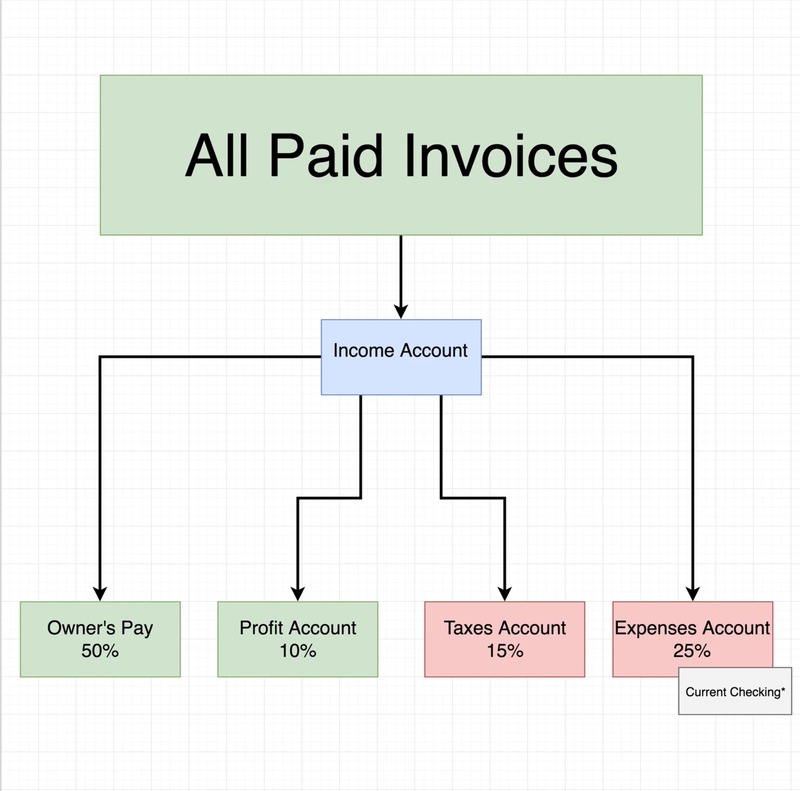 Later on, as your business grows, you can create a separate account for Payroll. It is recommended that you keep your Taxes Account at a different bank and transfer 15% of your funds there either monthly or quarterly. That way you avoid the temptation of borrowing money from your Taxes Account or any other account, since that would defeat the purpose. Any Owner’s Pay can be transferred to your personal checking account. By paying yourself first, you ensure that you enjoy your business and make a living, while also restricting the amount of money you allow to go towards expenses. Your Profit Account should be used as an emergency fund or for quarterly bonus payments to your self. 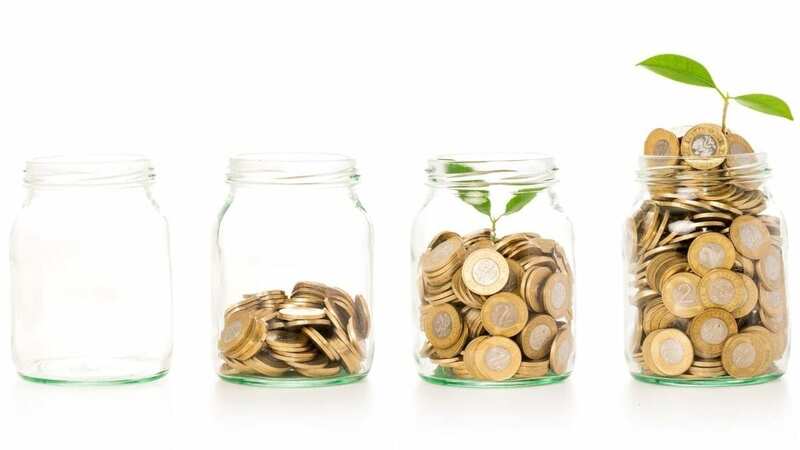 Once your business expands more you can open an separate emergency fund and put enough money in there to cover three to six months of business expenses. You can set a schedule to transfer money from your Income Account to your other accounts on the 10th and 25th of every month so you’ll have money ready to cover expenses by the 1st and 15th of the month, or choose dates that work best for you. Did you know that most photography businesses don’t last more than five years and many business owners in general don’t run a profitable business? To avoid following this treacherous trend, it’s best to start your photography business slowly. Do your best to cover start-up costs with money you’ve saved up instead of taking a loan or putting your expenses on a credit card. Additionally, don’t fall down the rabbit hole of spending so much money on gear that you put yourself in a deficit for the year. When you’re forced to do the best work you can with the resources you have, you learn to get creative with your shoots. Also, you’ll get that much better with the gear you have so when you can afford to upgrade, you’ll already have a good foundation of photography skills instead of relying on your gear to carry you through. Starting a photography business and keeping your finances organized so that you’re bringing in a profit every month can be difficult at first. If you’re willing to try the Envelope System to keep track of your accounting, you can make the process a whole lot easier. I definitely recommend it! Want to know more about pricing, sales, and business applications for your photography venture? Learn more when you sign up to for a premium membership. 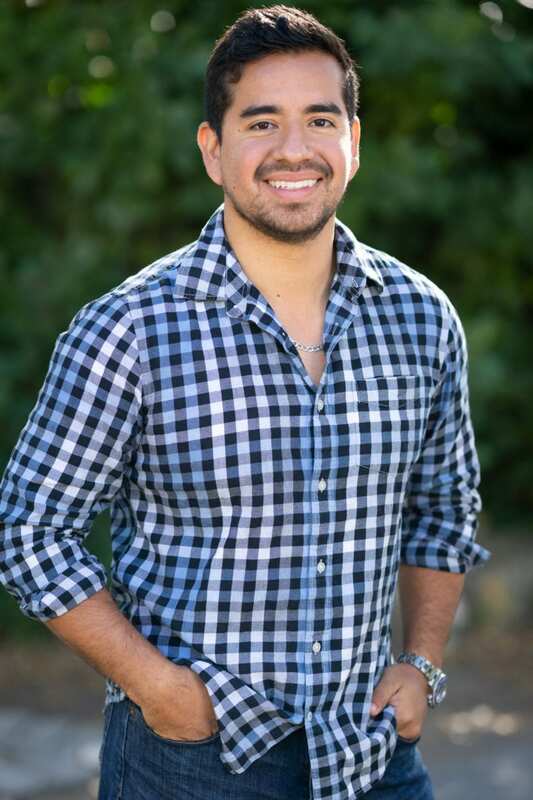 Humberto Garcia is the Founder and lead Facebook Ad Strategist at The Digital Marketing Studio. As a former portrait and wedding photographer, he specializes in coaching other photographers on how to generate leads and revenue for their businesses. This is an excellent article on how to get your finances organized. Thank you so much. I especially like this added separation of taxes and business expenses. I’m in my second year and am just starting to see a profit. Paying yourself 50% is higher than I anticipated. I was already aware of the 10% profit, but would have put taxes higher at about 30%. Maybe I’m misunderstanding something. Actually, the 15% is for taxes is because you’re taking it out of gross. It’s a much easier way to calculate because it’s factoring in the fact that you had expenses. If you save 30% of gross if you made 100k but you had 25k in expenses, you won’t be liable for taxes on 25k and you’d of over saved. At the same time, very very few people actually average out to owing 30% taxes of even their net income. If someone earned 75k profit in Florida, a state with no state income tax, they’d only be taxed at a rate under 21%%, not 30.